Have you heard that Blockchain is going to drastically change the world and become the downfall of the conventional banking system? Blockchain ledger technology seems to be tapped into a lot, though for the most of non-tech folks these terms remain an elusive concept. Even many tech folks are still not up to speed. In fact, the concept of blockchain is simple. When you understand what it is and how it works, you’ll be able to cut through the fuss of cryptocurrency world. The Blockchain is a type of distributed ledger – a shared record book – a digital system for tracking data (a digital chain with blocks where each block stores data). Blockchain algorithms and distributed structure keep information protected and publicly available. This allows monitoring transactions between two parties without an intermediary. What does Blockchain system do? But how does Blockchain do it? A little bit of patience, we’re going to unveil it in detail below. This guide is designed to deliver a clear and simple introduction to the technology. Blockchain first appeared in 2008, in a white paper authored by yet unknown Satoshi Nakamoto. This 9-page document described “a system for electronic transactions without relying on trust”, detailing an innovative peer-to-peer electronic cash system called Bitcoin. The launch of Bitcoin in 2009 was the first real-life use case of blockchain technology. The initial report explained how bitcoin could be used for sending and receiving payments without a third-party financial body (commonly, a bank institution). The first Bitcoin app was released at the beginning of 2009. In the middle of 2010, the mysterious Satoshi Nakamoto (whoever it is) has totally disappeared from the Bitcoin scene. It took the open source system several years to amass nearly one million Bitcoins. But still, what is Blockchain? Trying to find a simple definition of Blockchain technology, despite the numerous articles on its essentials, you’ll either find a super-technical description that will confuse you even more, or something very tightly connected to Bitcoin. The Blockchain is a decentralised record-keeping system. Transparent and secure. Its distributed database (in simple terms, a shared record book) is indeed a top-notch advancement protected from revision and tampering. 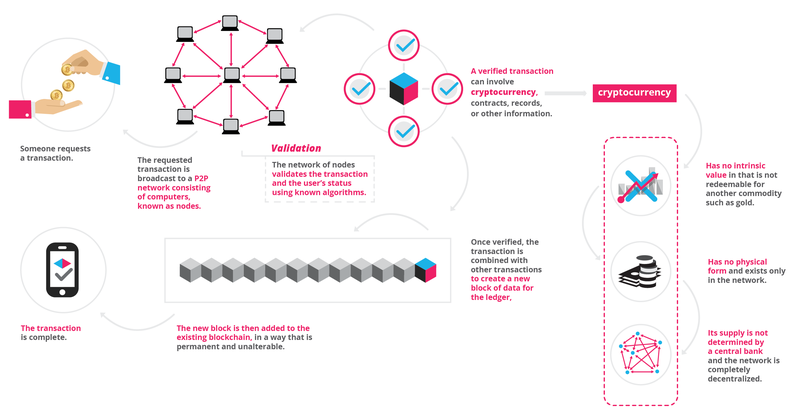 Blockchain holds a permanently growing list of records; each set of records is stored together as a block, then connected to other blocks in chronological order – never erased or changed. Basically, these blocks aren’t stored in one location and then shared by others. Instead, there are numerous copies stored on computers all around the globe, that’s why it’s called distributed. With numerous copies across thousands of devices, Blockchain offers a secure way for untrusted parties to reach agreement on a digital history. Why is it important? Any digital staff (transactions, tokens, assets) can be easily double-used, duplicated or counterfeit. As can be seen in the diagram below, a distributed ledger (also known as our shared record book) solves this problem without using a trusted third party. Imagine a spreadsheet that is copied hundreds of times across the network while the network is designed to regularly update this spreadsheet. This is how the blockchain works: shared data is continually reconciled, so the records it contains are verified. All of the distributed ledgers in the network are updated and contain the exact same chain of transactions. To explain how “ledgers” could be synchronized across the network to have the same record of transactions, PixelPrivacy illustrated it with infographic examples in their article “What Is The Blockchain? The Plain English Version“. Looking to hire blockchain developers? What’s under the blockchain security hood? Dissimilarly to traditional ledgers that offer “total privacy”, Blockchain technology works with public transactions. Hosted by many computers synchronously, its data is accessible to all network users. Blockchain creates dependencies between digital events, hence, it ensures security. Actually, the level of blockchain app security goes miles ahead of other similar services. To steal or change any information in the blocks, a scammer would need to change the data of more than 51% of all users. Considering how huge the network is, this sounds unrealistic. Blockchain stores all transaction/record data in blocks, attaching each new block to a previously sealed block in order to create a chain of accepted history. To make the chain secure, the network algorithm ensures that each transaction is unique. After the block is sealed and linked to the previous one, it can’t be changed, modified, or deleted. Roughly speaking, this is what makes “a chain of informational blocks” a real technological triumph. To learn more about how secure blockchain is and to visualize its underlying processes, check out this guide. One may wonder where the system gets so many devices to store its copies on. The database is simply shared between users’ computers. A user becomes part of this global system when he/she, for instance, creates a Bitcoin wallet. Where can I use Blockchain? 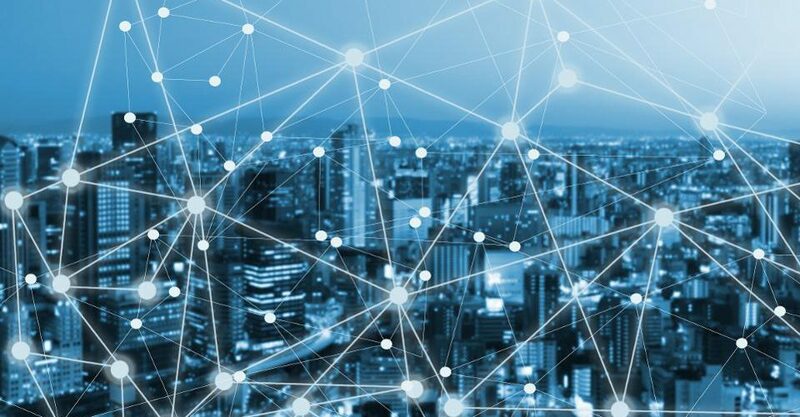 Blockchain services remove the need for a trusted intermediary, allowing to buy, sell, and transact with no need to spend additional money and no fear of being scammed. Despite the fact that initially the algorithm and the distributed structure were designed for Bitcoin crypto-currency operations, Blockchain solution can be used to record a lot of different “things”. Actually, one of these “things” could be an issue that needs a record of ownership and where a trusted intermediary is not a preferred option (be it the ownership of a land parcel, a car, or an ice-cream). Considering the fact that digital security is nowadays a global problem, hacked databases and breached accounts point to its growing topicality. The data breach at Target in 2013 was reported to have spilt info about as many as 70 million customers. Personal information was hacked, i.e., names, addresses, phone numbers, and e-mails. This actually happened because the common centralized databases use password-based access methods. Blockchain, however, uses digital signatures for identity verification. These signatures are based on public key cryptography, which allows blockchain apps to offer a secure storage of digital identity data. The shared database technology offers a solution to many digital identity issues, from passports to birth and wedding certificates to IDs and e-residency. With blockchain, people can move any digital information like personal data or ownership right, but the most popular use of blockchain remains cryptocurrency (electronic money like Bitcoin or Ether). It’s no secret that digital money transactions require an intermediary to verify operations and keep all payment records. If there is no trusted middleman that verifies our transactions, theoretically, we can spend the same amount of money several or, actually, unlimited number of times. Safety (both parties can be sure the transaction is valid). Who is already using blockchain technology? According to a 2017 Juniper Research, blockchain is considered by more than half of the world’s largest corporations. And two thirds of companies expect it to be integrated into their systems by the end of 2018. In accordance with a survey by the World Economic Forum’s Global Agenda Council, in 2015, around $20 billion of global GDP was held in the blockchain. Basically, this is only around 0.025% of the total GDP, but the number continuously keeps growing. 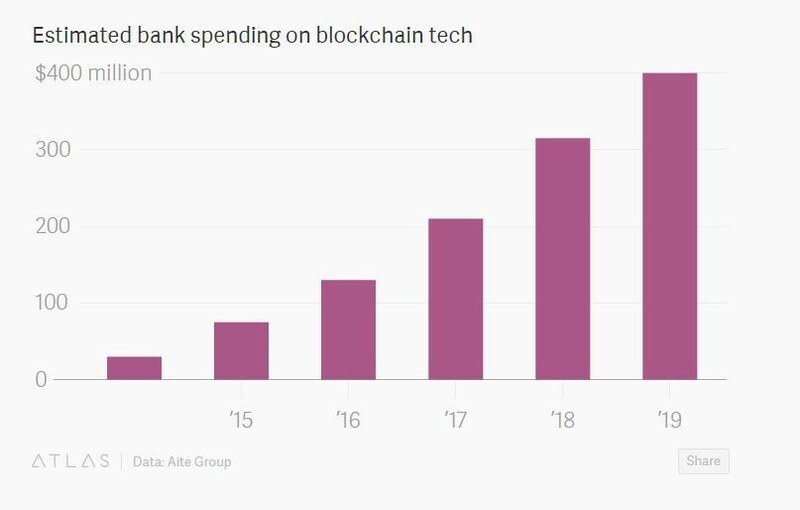 Banks, insurers and tech firms see blockchain as a way “to speed up settlements and cut costs.” They are predicted to multiply those spendings by 2019. Transparency is what makes it even more engaging. The official blockchain website allows you to perform transactions in real time, evaluate the statistics: current number of blocks, time between blocks, cost per transaction, etc. The system uses distributed insurance models, hence totally transparent risk management. We have hardly scratched the surface of the blockchain technology, so a few more articles are on the way to our blog. You might also be interested in the recently published article unveiling how many cryptocurrencies the world needs. The article was originally published on Vakoms Blog. Vakoms is a one-stop software company offering a full range of solutions and services, starting from IT consulting and finishing with product development from the ground up. Bitcoin Essentials – What’s the Hype All About?